Composting Basics Workshop may be the upcoming event you’re looking for. 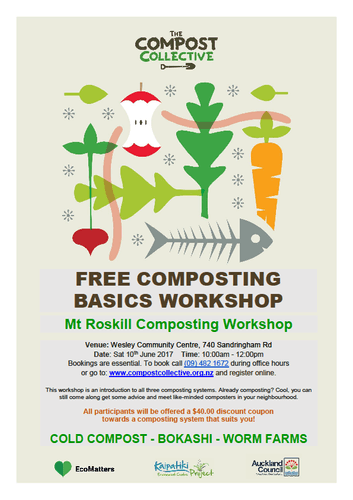 To book call (09) 482 1672 during office hours or go to: www.compostcollective.org.nz and register online. This workshop is an introduction to all three composting systems. Already composting? Cool, you can still come along get some advice and meet like-minded composters in your neighbourhood. All participants will be offered a $40.00 discount coupon towards a composting system that suits you!